Last week early orders of the new Apple Magic Keyboard and Magic Trackpad started arriving at door steps even before they started arriving in stores. I have now spent a couple of days on the new Magic Keyboard and Magic Trackpad and here is what I have found. The keyboard with the new internal butterfly mechanism and larger key caps feels very nice to type on. Quick lightning charging and simplified paring makes it an excellent keyboard for daily use. It came nearly fully charged and I plugged it in for a few minutes to see the new auto pairing feature. Only time will tell how long internal battery will last but in four days I haven't seen the battery percentage drop at all yet. 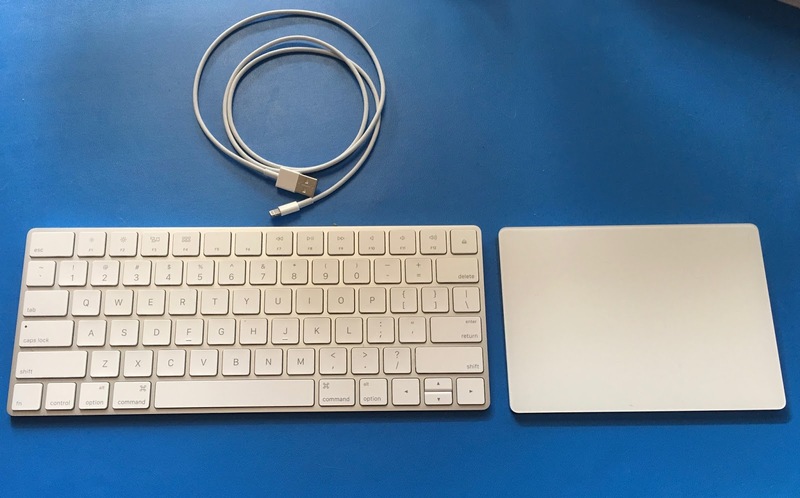 Taking it out of the box and plugging it in to the computer with the lightning cable made the keyboard automatically pair with the computer making it even simpler to setup than going to Bluetooth and entering the six numbers that appear. Plus who hasn't had that moment when they realized they needed a new keyboard and mouse and had turned off the feature to automatically open the app to connect a keyboard and mouse when one wasn't detected and been stuck going to look for a wired keyboard and mouse to setup the wireless ones? Well now just plug it in and it pairs and is ready to go. Then you can unplug it at your leisure. The thing some people may not like about the much thinner and smaller physical keyboard size is now like on the mobile computers the up and down arrow keys share a single key cap. Sorry gamers I know you won't be crazy about that. Even I am not a huge fan of it. Although now my laptop and desktop keyboards have the same approximate feel to them. It also struck me that Apple had an opportunity to add a finger print reader to the keyboard or trackpad and didn't do it. I can unlock any other iOS device and use credit cards with my finger print. 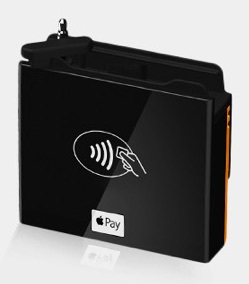 I really would have expected to see the keyboard include a finger print reader so Wallet can be used from my desktop and finally be able to use Apple Pay from my desktop. The TrackPad is a huge improvement. It has a much larger surface area and features Force Touch. Allow users to have left click, deeper left click, right click, and a whole host of gestures to make the desktop more useful. As developers start taking advantage of Force Touch I am sure we will see it more in desktop applications. It takes a little getting used to the Force Touch feature as I occasionally end up clicking too hard when trying to drag a file somewhere and force touch instead of left click by accident. I am sure it is an adjustable setting. For now I am just trying to get used to lightly tapping on the trackpad to see if I get used to it before I start changing settings. I try to test out the defaults first to see how it works before I start customizing the experience. 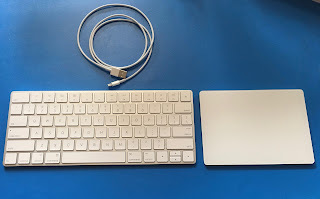 Overall the new Magic Keyboard and Magic TrackPad has made my two year old iMac feel newer and give me access to all of the features of OS X 10.11 and I am sure as time goes on we will see more features take advantage of Force Touch. Now the new Magic Keyboard is a price jump of about $20 to $99 and the Magic TrackPad increased in price from $69 to $129 a $50 price increase over the previous models. So far I have only replaced two of the three keyboards and trackpads I use given the price jump. However, I believe the devices are worth it given you will not be buying replacement batteries again and given how long the previous models lasted these new devices will likely last many years to come. So think of it as a long term investment in your technology and it is the piece of technology you touch as much as or more than your smart phone so it should feel good to use. My consulting business has been growing and people are starting to ask if they can pay by credit card. I had a system I setup in 2012 but only rarely used. So I dusted off the old Square reader and tried it. It didn't work anymore and needed to be replaced. So off to the Apple Store to get a new reader. I asked for a reader and was handed a payanywhere.com reader. I didn't look too closely at the package and noticed it wasn't what I thought when I got home, but they offered lower rates than Square so why not setup an account and give them a shot. The device looks nice and is packaged nicely but the service from the company is horrible and tech support is useless. The initial limits were too low to be useful. I could initially only sell $10 or less at a time and a low daily and monthly limit. So even a poorly attended garage sale wouldn't make this device useful. Emails from the company are poorly phrased and don’t make requirements clear. I had a three day delay because they said they may ask for a document. They never asked for it just expected me to send it because they said they may want a copy of my business license and three months of bank statements. My first interaction with the chat system listed the wrong business hours and disconnected me when it was stated to be open but were not really open at that time. The first support person I talked to lied to me and told me Square doesn't have a customer service line. I didn't know that I never needed it. (It was a lie they do have one and they were helpful.) It had taken days to get any sort of response which has slowed my ability to do business and take payments. Ultimately I went out a bought a new Square reader to process payments from my clients. When requirements were finally made clear I was asked to email or fax my bank statements. I don’t own or use a fax machine anymore and haven’t for the last decade. The tech suggested I go out and pay Kinko’s or someone else to fax it for me. Would you want to give your bank statements to strangers to fax? Email isn’t secured or offer an encryption option. So the bank statement request is protection for them but not for the merchant. It would be trivial to put an upload button on the secure site to upload a document that is requested. The second support tech was kind and tried to be helpful but wasn’t really able to do much or advance the issue. I let her know I was on a time crunch because a client had been trying to pay me for days while I spent hours sorting this mess out. This is of course costing me money and time. Finally this morning they raised my limit but to a lower limit than I had requested which still doesn't make the device overly useful. I used Square to take care of my clients and while on the phone with Square support I asked if these transactions would work. They said if they have questions they will ask me but none of their procedures are designed to impede merchants or business. Unlike PayAnywhere who's entire system is designed around throwing up roadblocks and impeding business. Finally to top off this entire mess the product packaging promised $5,000 in free transactions when signing up. I used my own credit card as a test on a $1.00 transaction to make sure everything worked and they charged me for it. So much for the first $5,000 in free transactions. For me and my business I am going back to Square and will patiently wait for my new reader to come and they supplied me with a $10.00 credit for the $10.00 reader I purchased so I could continue to take credit card payments. So for Square they get an A for customer service and as for PayAnywhere they get an F for customer service and I am canceling that account and will not recommend PayAnywhere to anyone for any reason. I am not alone in this opinion doing a quick search on Google later many review sites have given PayAnywhere poor reviews and there are always hundreds of former customer comments about a myriad of issues around using the service.